ROCKINGHAM — Robert Wilson V figured he had one change. So he better not mess it up. 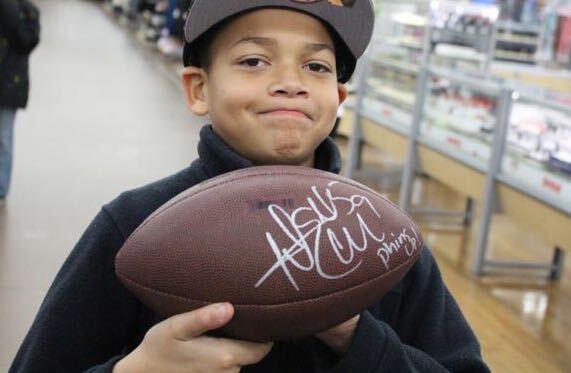 It seems like this young man is proud of his Dannell Ellerbe autograph. 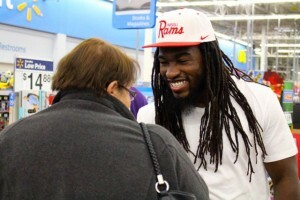 The 5-year-old Cordova boy was very careful in how he spent his gift certificate awarded him by Miami Dolphins linebacker and former Richmond Raider Dannell Ellerbe on Monday morning in Walmart. And other than ordinary guidance he would get at home, Robert was free to purchase whatever he wanted. 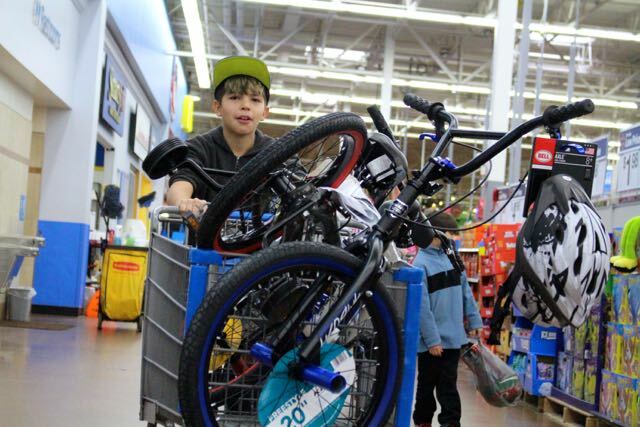 “It’s your day,” said Christine Wilson, Robert’s grandmother, who shepherded the family — including Robert’s mom and dad, Elvira Lopez and William Wilson — through the aisles of toys. Christine Wilson had every reason to think Robert would make the right choice; after all, if he gets to where she believes he will in life, he’ll have to make many of them. “This guy’s going to be the one that discovers a cure for cancer,” she said of her grandson. Robert’s last item? A book, and it helped him come in under budget. 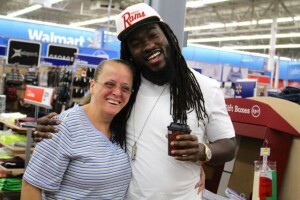 A stranger realizes what Dannell Ellerbe is doing for the children and approaches to offer her gratitude. Ricky Ollice, meanwhile, managed just as well. With parents Mark and Joan in the background — and no, Joan, Dannell Ellerbe was not on the list of things people could take home — Ricky ranged from practical to creative in his choice of items to fill his grocery cart. A Nerf gun was a necessity, Ricky figured. So were jeans and a couple of belts. A CD didn’t fit under budget, so that item had to be re-shelved. This is the third time this year Ellerbe, rehabbing from a hip injury that has sidelined him this season, has helped to provide for and inspire the young boys and girls trying to follow in his footsteps. In July, Ellerbe hosted his annual youth football clinic at Richmond Senior High School. Some 200 young athletes participated — at no cost. Last month, Ellerbe and his wife staged themselves at the Richmond County Aging Services building on Lawrence Street in Rockingham. Together, they funded and helped distribute 85 meals to county seniors. 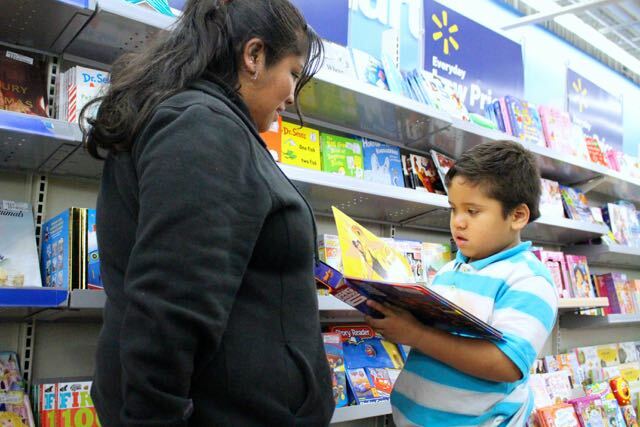 Robert Wilson V, 5, of Cordova, shows his mother, Elvira Lopez, a book he might want to purchase as part of a Christmas gift from Dannell and Shervella Ellerbe. Ellerbe played a key role in the Baltimore Ravens’ 34-31 victory over the San Francisco 49ers in Super Bowl XLVII in February 2013. A month later, he signed a free agent contract with the Dolphins. On Monday, though, most of that was put aside as Ellerbe gracious accepted any and all autograph requests. The only person he turned down was a woman who wanted to take him home for Christmas. As an Ellerbe-coordinated event, one could reasonably think that Ellerbe himself would be the one to pull off any surprised. That wasn’t entirely the case. Raymond Bonds, Ellerbe’s stepfather, was inside the Walmart lobby area waiting for the former Raider to arrive. Among the 59 children selected to participate Monday was Bonds’ grandson, a Fairview Heights Elementary School student. Robbie Hall, director the Richmond County Department of Social Services, said it was Ellerbe, who turned 29 last month, and his family who reached out to his agency to help fund Christmas for the 59 children — 59 being the number he wears on his Dolphins jersey. 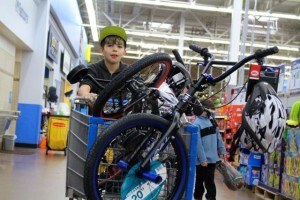 Jayden Mendez, 9, pushes out his cart full of items. He and his siblings had a total of three gift cards to spend on their Christmas. Joan Ollice shares a laugh with Dannell Ellerbe, former Richmond Raider now of the NFL’s Miami Dolphins. can you tell me what was the ages of the children that were chosen ? That was a wonderful thing Mr. Ellberbe did for the kids in Richmond County. I am sure this is something those 59 kids will never forget. You are truly a special young man with a big heart. Happy holidays to you and your wife.